My mission to watch all of the TOP 250 films listed in the IMDB site (as of March 22nd) continues. Since I set myself the goal, I have watched 3 of the 125 films I have yet to see, which makes me believe I need to up the tempo if I want to succeed within the 2-year time frame I’ve given myself. The 3 films include the previously reviewed Blade Runner, 2008’s Gran Torino directed and starred by Clint Eastwood (upcoming review) and the last best-picture Oscar winner: The King’s Speech. In another post, that I published a few days after I started this blog, I gave my personal list of the top 10 movies of 2010, with the glaring omission of the Oscar winner for best-picture that I hadn’t seen at the moment. 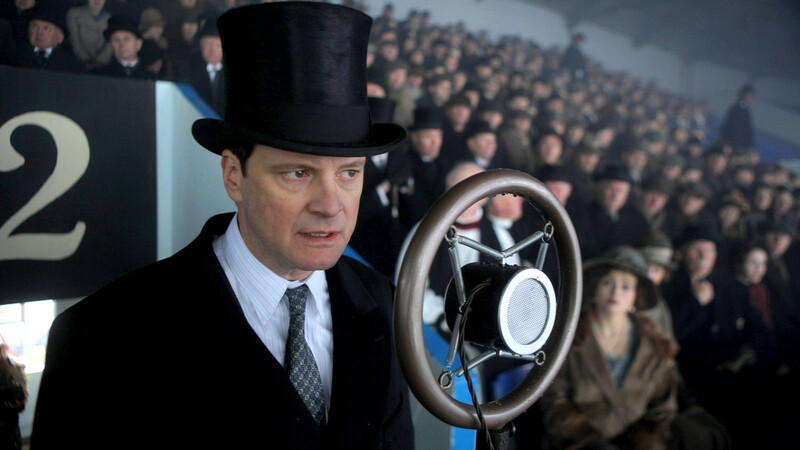 It is now my belief that my winner for 2010 continues to be Inception, but the time-piece starred by Colin Firth as the stuttering King George VI deserves to be placed in close second. The motion picture is one, among the great contenders for Oscar gold, that excels in its simplicity and that relies, primarily, on the romanticism of the story and the craft of a very talented cast. The movie is set in England, right before the passing of King George V and in the years leading to the beginning of WWII. The story follows the ascendance of the younger son of the king of England (Colin Firth), referred to as “The Duke of Yorke” by the commonfolk, or simply as “Bertie” by friends and family. The Duke is quickly presented to us as a man with a stammer that steams from deeply rooted insecurities, none greater than the fear to public speaking. It is apparent early on that this is also a man of good, with love and care for his family, and an honest interest to serve his father, the King, and the British people. The duchess, remarkably portrayed by Helena Bonham Carter, is in love with that man. She feels that he is in pain, trapped inside his body, unable to speak his mind and fulfill his calling. The duchess seeks for treatment time and time again and, with every unsuccessful attempt, pushes her husband closer to a helpless frustration. Happily, she eventually comes across an eccentric therapist named Lionel Rogue, played by the ever-charming and wonderful Geoffrey Rush, that quickly shows a reluctant and pessimistic Duke that it is indeed possible to overcome his stammer. The complexity and frustration of the Duke’s inability to speak is impressively portrayed by Colin Firth, deserved Oscar winner for Best Actor, and his performance is accompanied by a cast that is as effortlessly great as its leading man, making the story work with every scene, and allowing us to fully immerse in the struggle of an intelligent young prince that rises to King despite all of his fears. The King’s Speech is simple in that it relies on a linear time-piece type story that is more or less well known. The rise of the young Duke to the throne of England is a story of great improbability that portrays an otherwise unapproachable figure as a deeply human and flawed man. In his quest to overcome adversity, he conquers his fears, reaches his full potential and, in doing so, builds an unlikely friendship with a therapist who he would have never spoken to as his equal in any other scenario. The movie is as much of a buddy-comedy with a lot of heart as it is a romantic story about overcoming adversity. Unlike other critically-acclaimed movies of 2010, The King’s Speech does simple things remarkably well, which is better than trying to be different but failing to do so. The director, Tom Hoopper, reminds us that there are still “real” and moving stories that treated with care and with the right cast can excel beyond its scale, and beyond Oscar-gold, to become one of the best films ever made.